Climate change and improper land use practices are increasing the frequency of dust and sand storms which is having a negative impact on the health, environment, and economy of affected areas. A dust storm blowing in. A meteorological phenomenon, dust storms are common across semi-arid and arid regions of the world. When strong winds, also known as gust fronts, blow loose dirt and sand from the dry land surface, it results in a dust storm. Where Are Dust Storms Common? Drylands around the Arabian peninsula and North Africa as well as the arid regions of Iran, Pakistan, and India are all susceptible to dust storms. The arid and semi-arid areas in China also experience such storms. In the Sahara Desert, where sand covers the land, sandstorms are the more preferred term since here the wind blows up huge volumes of sand from the desert surface. Sand is coarser than the finer dust particles, which means sandstorms are more devastating in nature than dust storms. What Causes A Dust Storm? Dust storms are facilitated by the processes of saltation and suspension, processes that move soil from one place and deposit it in another. As a strong wind moves over a dry and dusty or sandy terrain, the larger dust or sand particles will first vibrate. Then, the particles will saltate (leap) from the ground and fall back repeatedly. This process will break down the salt or dust particles to smaller particles. Soon, the particles will be small enough to remain in suspension and thus blow with the wind to faraway places. 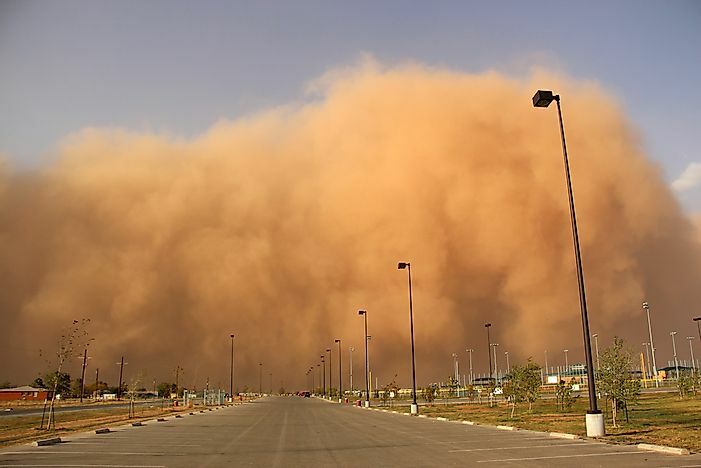 Gusts that transform into dust storms may be produced when air cooled by rain after an intense thunderstorm begins to flow or a dry cold front moves into a dry air mass and flow over hotter terrains. In arid lands like deserts, dust storms are caused primarily due to thunderstorm outflows or due to the creation of strong pressure gradients leading to high velocity winds flowing over a large area. The weight of the suspended particulates and the atmospheric stability determines the vertical extent of the dust or sand that is raised. In some instances, particulates may be raised as high as 20,000 feet above the ground. Poor farming and grazing practices can trigger dust storms in an area. Dryland farming is one of the farming techniques that might expose dust and sand to the air. Intensive tillage, a dryland farming technique where land remains bare for a certain period of time when no cover crops are there to protect the land, often creates the perfect land conditions for dust storms. Thus, soil conservation practices need to be adopted to protect the top soil against wind erosion. Dust and sand storms have increased over the years largely due to the adverse effects of climate change and improper land-use practices. Sand storms in the desert can be extremely treacherous and stall traffic through desert roads for days. The reduced visibility during such storms often disturbs life in the desert and people have to wait to get out of their homes in search of water and food resources. Such storms also damage the landscape, cause the shifting of sand dunes, and catalyze the desertification process. Today, dust storms are more frequent in nature. In Mauritania, there were only about 2 dust storms annually during the 1960s. Now, the number has increased to 8. Even within the span of a single year, levels of dust blowing from the African east coast increased 5 times between 2006 and 2007. Long-term exposure to dust storms can severely impact the health of individuals. It increases the chances of lung infection. People with asthma have worsening symptoms. It also leads to increased morbidity and mortality in people due to asphyxiation. Long-term exposure to dust particles might lead to silicosis and lung cancer. The danger of keratoconjunctivitis sicca or ("dry eyes”) might lead to permanent blindness. Dust storms have a negative impact on agriculture in the affected areas. The abrasive action of such storms might adversely affect young crop plants. Also, the top layer of soil containing nutrient-rich light particles and organic matter are removed during such storms. Road and aircraft transportation are affected during such dust storms due to reduced visibility. Not all effects of dust storms are bad. The dust blown in from the Sahara by wind blowing over the ocean reaches Central and South America and is the source of nutrients for the rainforests growing in these regions. Plantain growth in Hawaii is facilitated by dust accumulating on land during such storms. Ancient dust storm deposits called loess acts as highly fertile top soil for crops grown in China and the mid-western US. Dust storms are known to occur on Mars where the storms have a much wider extent than on our planet and often encircle the entire planet. Wind speeds can be as high as 60 miles per hour. However, winds cannot attain the speed of hurricane-force winds of Earth due to the much lower atmospheric pressure on the red planet.